Was exactly what I expected for the money...satisfied. nothing special, location is not nice, check in is far away from the room but staff very friendly. I do love the place, as it's not like a hotel room. There are fully equipped with the cookery. Had been sent to one room and the air-con was not working. Moved to the other one with also air-con problem (noisy). Not good quality for the sanitary ware such as shower (Really not practical to use). clothes rack in the bathroom was torn apart (when we just touched it, not even use it yet). Apart from those things. This is a very good place to stay. I recommend the management try to stay a night and use all the facility in the room and see how it's like. For small serviced apart, for a solo traveller wanting some decent space, this is an excellent choice. Mini kitchen facilities are just what you need for cooking, and water and coffee is restocked each day. Great service guys, thank you. I can't rate the location fairly as it depends are your travel needs, there's no beach, view or pool but hen I didn't need any of that so it was perfect for me. On a busy street, but again that is what I wanted. I have already booked in for a return visit. Thanks Two Villas. It is my 2nd time staying at Two Villas Suite Service Apartment that its been fantastic. Though a little way out to many locations, but where is is located is pretty self contained. The small kitchen provided is sufficient to whip up a simple meal, otherwise there are food stalls along 2 flanks of the road and a self-sufficient Tesco Lotus just few doors away. Two Villas also provides free transfers to Nai Harn Beach and Phromthep Cape which is awesome. Nai Harn beach never fails to amaze me. Beautiful in green and blue. I will recommend this place to anyone who is looking for a small town to stay in Phuket, away from the hustle and bustle of Patong or Karon. Get a motorcycle or a car to drive around. it is very convenient. The hotel was located in a good place to get around if you had or didn't have a motorbike. There are many eateries around the area. 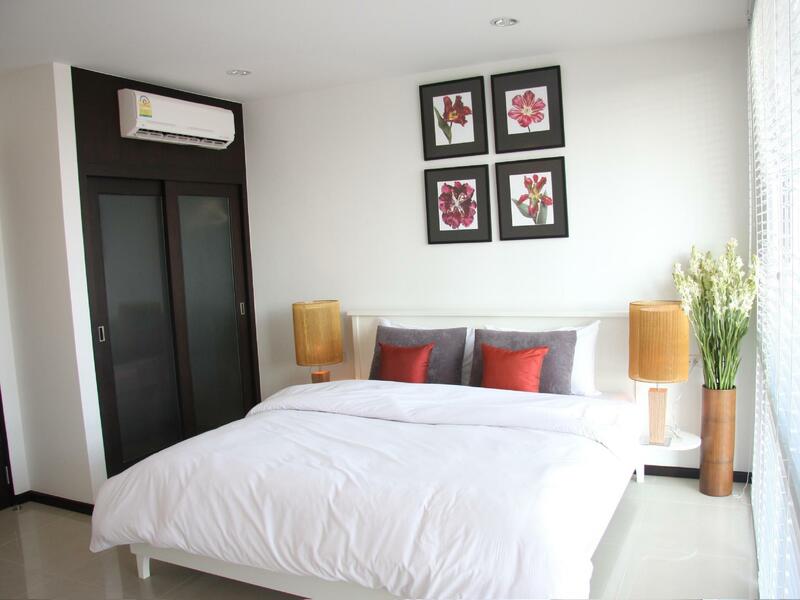 The apartments are spacious and the bed is comfortable. Unfortunately it got off to a bad start when I was dropped off by my Thai friend who owns a taxi and runs a tour business and her daughter. She told me the man at the front desk said rudely to her 'Why are you here? Why so many people' She explained she was dropping me off and then he had a sour looking his face. Other than that though the room was good value for money, the bed comfortable although the pillows not. The bedroom is not very dark so bring your eye mask. When checking out I was charged 720Baht for a stain from my hair tie on the sheet which I'm sure could have been taken out with bleach. Anyway I paid the charge and took the sheet. All other staff were very polite and professional other than the guy on the first day. Better places around for price. It was cheap and clean. Nothing much to ask for. Air-con wasn't cold, and the driver forgot to pick us up couple of times. Other than that, everything else was great. The staff at reception were very friendly and helpful. Conveniently located close to shops and massage places. Overall the rooms were perfectly clean, not overused and functional. It was good. Worth for the price. Service is good. Location is nearby the road. Easy access to muslim food and 7E..hotel can arrange taxi n motorbike rental for you. P/s: naiharn beach is 10minutes aeay and hotel provide free shuttle service. We arrived Phuket at midnight, and we will change to Private pool villa on the next day. This apartment is cheap, so we choose here to have a short stay. It is not very suitable for long stay, but it is good to stay 1-2 nights with a very cheap price. It is clean and with full equipment. This is 2nd times we stay here.